Submitted Photo Vice chairman Susan Washington Sipos read the list of names, and Chaplain Diane K. Shaw placed a carnation on the altar in memory. FALCONER – The Thule Lodge held its annual Memorial service recently. The lodge is the Swedish organization in this area, formed 111 years ago. The organization, which is a part of the international Vasa organization, was formed to help the Swedish immigrants settle in the United States, with their employment, housing and schooling. Today, the lodge preserves the Swedish heritage through events and activities. Recently the annual Memorial service was held to remember those members who died in the last year. 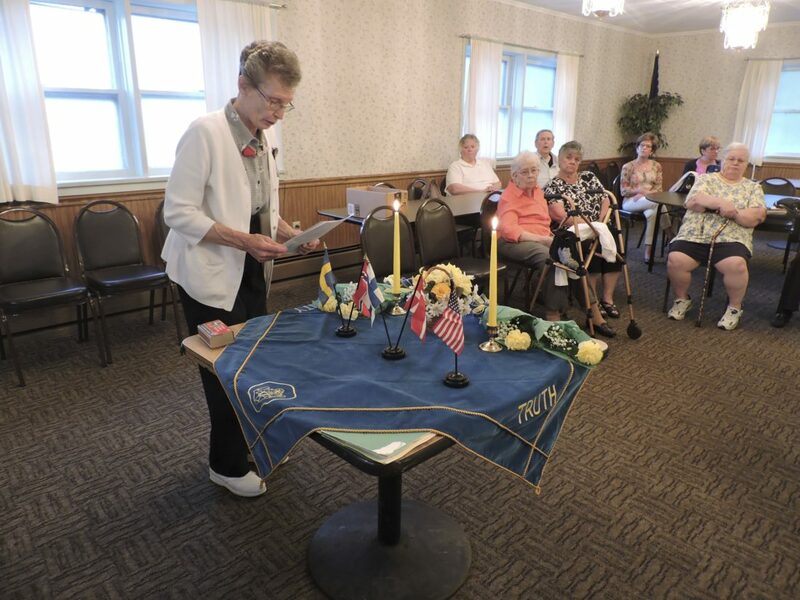 Lodge Chaplain Diane K. Shaw of Cassadaga, and Vice Chairman Susan Washington Sipos, also of Cassadaga, conducted the special service. Members of the lodge attended, along with family members of the deceased. Vice Chairman Sipos read the list of names, and each time a carnation was placed on the altar by Chaplain Shaw. Following the ceremony, family members introduced themselves and spoke of their family. Each family member was welcome to take a carnation in memory. Special Swedish Memorial music was played by vice chairman Sipos. Following the service, all were welcome for refreshments including a cake decorated by Ranee Kaus of Cassadaga. Sandwiches on homemade bread were provided by member Donna Johnson. Cake was served by lodge historian John Sipos. The chairman of the lodge is Tom Eckberg, secretary is Lynne Meyers, and financial person is Loretta Smith. New members are always welcome to attend.